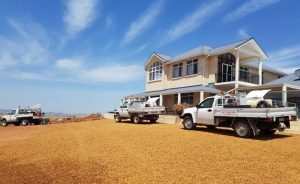 Midwest Pest Management Services is a family owned and operated pest control business based in Geraldton, Western Australia. Coming from a rural background has given us valuable insight into the specific needs of our rural clients. Our principal, Danny Polain has over 28 years of extensive experience in the Pest Control Industry and our technicians, are fully trained and extremely thorough in the services they provide. We take pride in our work and strive to provide a professional service. Our Office Manager has over a decade of Pest Management experience in the field as well as in the administrative side of the business, giving her a great understanding of all aspects of the Pest Control Industry. Midwest Pest Management is Proficient in all areas of Domestic, Commercial and Government Pest and Weed control. Our reputation is a result of years of accumulated experience, expertise and a constant commitment in maintaining the highest professional standard. When you rely on us, you are also relying on the quality of our services. Continued professional training keep our staff ahead of the rest to ensure that the best is available for our clients. We pride ourselves on providing prompt, professional and reliable service. Midwest Pest Management is committed to providing a safe, healthy work environment. We strive to develop a culture that supports our “Health and Safety” values by encouraging behaviours and implementing processes that ensure the health and safety of all employees, contractors and customers. The safety and well being of employees is given the highest priority and has a bearing on all commercial decision making. Midwest Pest Management is a Geraldton based pest & weed control company. We service a large portion of the State. Our service area runs from Perth right through to Marble Bar. Our focus is giving rural areas more accessible pest control service. Purpose – To provide pest and weed services through excellent customer service, professionalism and knowledge. Vision – To provide quality services that exceeds the expectations of our esteemed customers. Mission statement – To build long term relationships with our customers and clients and provide exceptional customer services by working to maintain a level of professionalism and current understanding of available pest control products. Core values – We believe in treating our customers with respect and honesty. We integrate understanding, integrity and business ethics into all aspects of our business functioning. Goals – Develop a strong base of key customers. Increase the assets and investments of the company to support the development of services. To continue to build a good reputation in the pest control industry. Midwest Pest Management is committed to managing all aspects of our operations in an environmentally responsible manner. We care about the environment and we ask our customers to do the same. The Pest Management Industry plays an important part in the nation’s economy, protecting our health, food, property and environment. The Association has approved this Code of Ethics in the interests of promoting a high standard of business conduct. Show a spirit of friendly co-operation with fellow members and assist them if possible when in need. Whilst respecting the reputation and practices of other members, be willing to report to the Association without hesitation any member whose conduct is considered to be detrimental to the good reputation of the Association. When giving advice to consumers, respect their right to detailed information regarding service treatments. When issuing a quotation – in addition to stating the price, the pest(s) and the nature of the work – specify the duration of the service commitment period.